Bardhaman awarded "Satyen Maitra Memorial Literacy Award"
Source : Sri T.K.Ray, Senior Geologist, Geological Division-II, S.W.I.D., Burdwan. Burdwan in West Bengal has become the number one district in India as it has bagged the first ISO: 9001-2000 certification from the Bureau of Indian Standards (BIS). 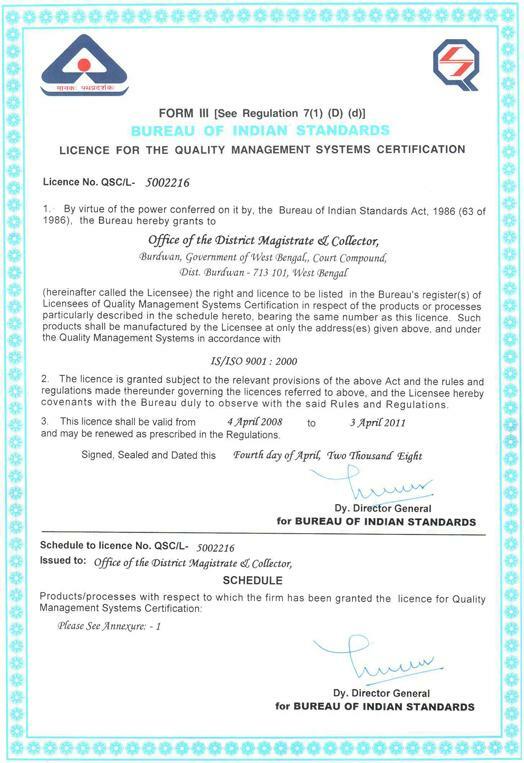 New Delhi: Burdwan in West Bengal has become the number one district in India as it has bagged the first ISO: 9001-2000 certification from the Bureau of Indian Standards (BIS). The award to Burdwan was given for quality management. “It is first of its kind in India approved by BIS. We feel proud and responsible. We will maintain the quality of service and improve further,” the Burdwan District Magistrate Manish Jain said while talking to iGovernment. Claiming that Burdwan is the number one district in West Bengal in terms of population (75 lakh ), the DM further added that citizens will benefit in terms of time bound quality and transparent service. Jain said that to keep the quality of service up to the mark, the district administration will go for a performance check every three months, while BIS will do the same after every nine months. He added that the BIS communicated about the ISO certification in the first week of April. ISO: 9001-2000 is a standard that defines the basic element of a quality management system (QMS) that an organisation should use to ensure that their products and services meet or exceed customers' expectation. To implement the basic element of the QMS in Burdwan Collectorate, the Government of West Bengal appointed National Productivity Council (NPC) as consultant. Under the guidelines of NPC Quality Manual, Management Review Manual and Procedure Manual were prepared. Special drive on Saturdays and Sundays was given for four months to ensure 'Clean and Green Burdwan Collectorate'. During the process, 5,189 kg waste papers were disposed off and furniture was repaired. Besides, documents in different sections were classified, arranged and labelled. The state government provided necessary office infrastructure like computer, fax and furniture to ensure quality of service. Jain said that the older system is replaced with newer system of an upgraded service quality. “In order to maintain quality of service, the administration offers unsigned service level agreement (SLA), which varies from a single day to a maximum of 15 days. It also offers a feedback system for suggestions as well as grievances,” he said. NPC-trained internal auditors audited different sections to find out critical gaps, to improve service quality further. This certification of Burdwan Collectorate is a leap towards 'Achievement of Good Governance for Public Service Policy' of the state government. It will help provide qualitative, reliable and timely administrative and public services in a transparent manner. “Although the other collectorates like Jalgaon and Latur (Maharashtra), Krishna (Andhra Pradesh) and Karvi Anglong (Assam) have been certified from other non-government ISO affiliated agencies, but not by BIS,” the District Magistrate said. The West Bengal Chief Secretary AK Deb received the award on behalf of the Burdwan District Collectorate from the BIS Director General. Dr. Subrata Gupta, Dist. Magistrate, Bardhaman and Prof. Saidul Haque, Chairman, District Primary School Council received on behalf of Bardhaman Zilla Saksharata Samiti "Satyen Maitra Memorial Literacy Award" from Dr. Murii MonoharJoshi, Minister of Human Resource Development, Govt. of India at the National Function on 8th September at Bigyan Bhavan, New Delhi. Honorable Speaker of Lok Sabha Sri Monohar Joshi presided over the National Function. "Satyen Maitra Memorial Award" was instituted by the National Literacy Mission in the year 1996 after the demise of Revered Adult Educationalist Lt.Satyen Maitra to recognise the outstanding performance in the implementation of Literacy Programme by Zilla Saksharata Samities. The award is given on the occasion of International Literacy Day every year to a District in the country selected on the basis of certain criteria fixed by National Literacy Mission and on the recommendation of Expert Committee. 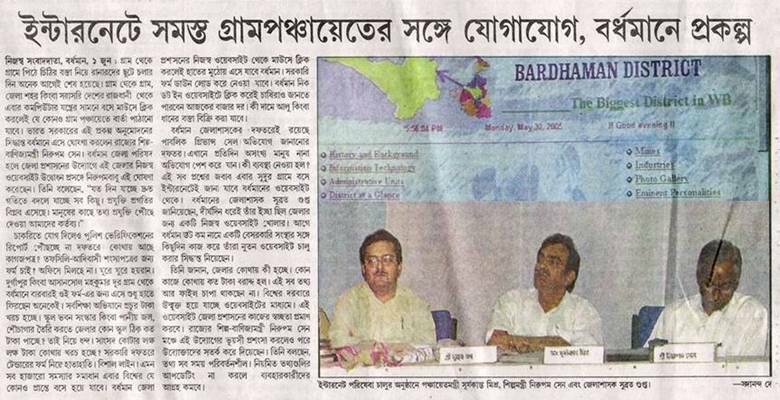 Bardhaman is the First District in the Eastern Region to receive this prestigious award . 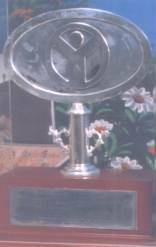 The award comprises of a Trophy and a Citation. Any Suggestion is welcome for improving this site. Please contact with DIO, NIC, Bardhaman for this purpose through mail or over telephone( 0342-2662582).